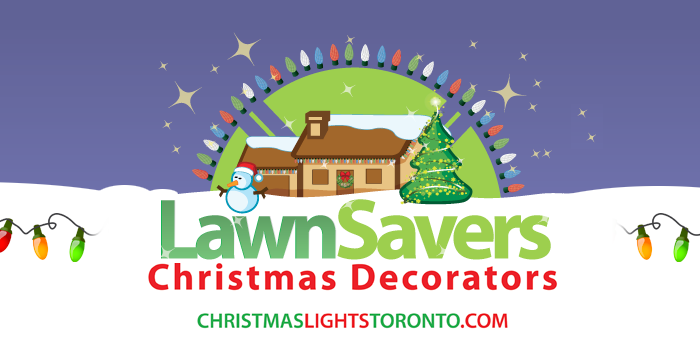 We are the premier Christmas lights installation company in Toronto and the GTA area. We specialize in custom installation of LED Christmas lights for homes and businesses. We measure each roof area and custom fit the exact length so there is no loose wire hanging around or jumping from roof line to roof line causing an unkempt appearance or hazard. Unfortunately, store bought lights don’t allow us this customization or flexibility that has become the hallmark of professionally applied lights that stand out from the crowd. If you are interested give us a call at 905-707-9994. Why Hire a Professional to Install Your Christmas Lights in Toronto? Are you another aspiring Clark Griswold, planning on spending hours climbing rickety, old ladders and untangling bundles of wire to hang your Christmas lights this year? Why don’t you let our dedicated team of Christmas light installation professionals take the work and worry out of the decorating process? We’ll ensure your home looks elegant, festive and fantastic! LED Christmas lights save you money in energy. According to Toronto Hydro, LEDs use up to 97% less electricity than traditional incandescent Christmas lights. For one string of lights, this translates to one dollar providing you 15 hours from incandescent lights versus 15 days from LED lights. Let’s assume your Christmas lights are in use for six hours daily, for a total of six weeks. If 10 strings of bulbs are used, the cost of electricity will amount to $264 for incandescent bulbs, but only $1.08 for 10 strings of LEDs! LED lights last longer than traditional lights. The life span of LED is up to 50,000 hours compared to 1,200 hours of an incandescent bulb. LED lights are 5-6x brighter than traditional Christmas lights. However simple or elaborate your decorating vision may be, our jolly professional design consultant will visit or meet with you at your home and work with you to combine your dream with our unique ideas into reality. Robust wreaths, thicker, fuller garlands and other festive greenery adorned with pine cones and ribbons will be sure to beautify your home for the holidays! What does your Christmas Lights Installation Include? We come remove the lights once the season is over. When it comes time to take down your display, we will also safely remove, inventory and store the decorations for you until we come back again next year. We guarantee your Toronto installation till Christmas. If any parts break on their own, we’ll replace them hassle-free!